At times, when you connect your Nexus 4 or any other Nexus device into your Windows PC, you might face the problem of the device not being recognized or detected. When this happens, it is not shown in your computer. This problem happens to me frequently. For me, it usually occurs when I try to connect my Nexus 4 phone as a media device (MTP). People might experience the same problem when they connect as camera (PTP). To solve this problem all you have to do is uninstall "Google Nexus ADB Interface" from "Android Devices" which is listed in your computer's "Device Manager". After uninstalling this Windows driver and reconnecting your device, Windows will re-install the driver automatically. Only this time, Windows will recognize your phone or tablet. Open your Windows Device Manager. It can be accessed from the start menu by typing Device Manager there. It can also be accessed by right clicking in your Computer icon and selecting "Manage" and then going to Device Manager. 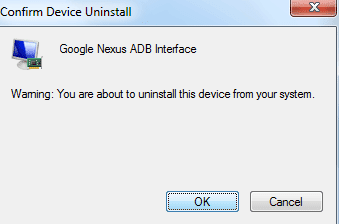 In device manager, under "Android Device" you will find "Google Nexus ADB Interface". Right click on it and click Uninstall. Confirm device uninstall in the next step. Reconnect your device and your task bar will say "Installing Device Driver Software". After a short while it will confirm that your device is ready to be used. Go to your Computer and find your Nexus device listed under "Portable Devices".